Today on Life Of A Nerdish Mum I am happy to be part of the blog tour for We Have Lost The Coffee by Paul Mathews. 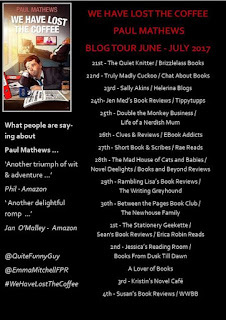 I have an exciting extract as well as my own review of the book. London, 2045. 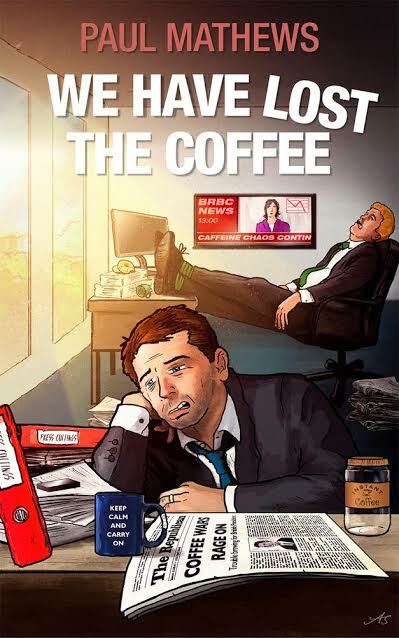 Three months into the Coffee Wars and Britain’s caffeine supplies are at critical levels. Brits are drinking even more tea than usual, keeping a stiff upper lip and praying for an end to it all. A secret Government coffee stockpile could save the day...but then mysteriously disappears overnight. We Have Lost The Coffee is the third book in the "We Have Lost" series by Paul Mathews. Though you don't have to have read the previous two books to have read this, its always good to have back ground information and character development. And well, they're good books! Howie Pond is a brilliant character, I love his obsession with being a secret agent and I found myself reading his voice in the style of Sean Connery. "His name is Pond, Howie Pond". His wit and charm definitely won me over and I laughed out loud at more than one point throughout the book. I feel the characters are all really strong and I really liked Howie's wife, Britt. She's a strong and independent woman. Britt and Howie work really well together and I think of them as a dynamic duo. The mix of mystery and comedy go together well. I only discovered this genre last year and I'm really glad that I did as I enjoy laughing along with the characters while trying to solve mysteries, Paul Mathews has taken a well loved genre and has added a layer of fun and lightness to it that complements it and is thoroughly entertaining. Being set in 2045 means that the story is far enough in the future to play around with things, like having a coffee war, but everything else is recognisable. It gives the author more freedom with how things work without it being out of the ordinary for the reader. As to the story, with it being a mystery I don't want to say too much as I don't want to spoil what happens, but it is extremely well written and planned out and I enjoyed both story lines of the missing coffee and the missing royal, there was enough going on without it being over whelming. A really enjoyable and funny read and one I'd recommend, especially if you love crime or mystery books but are in the mood for something a little lighter for a change. Overall a great book and I gave it 4 stars. 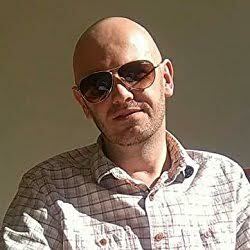 His two decades working as a Government press officer gave him an invaluable insight into all the key elements of modern government: bureaucracy, bungling, buffoonery, buck-passing and other things that don't begin with the letter 'b' - such as politicians with huge egos and very little talent. He's now putting that knowledge to use by writing about a British Government of the future - where, believe it or not, the politicians are even bigger idiots than the current lot. 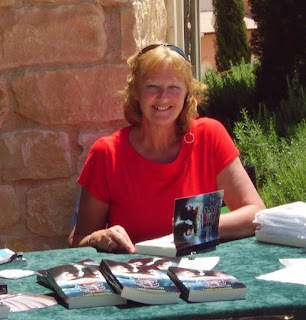 Today I am giving my review of Paradise Prison by Faith Mortimer. I originally received this book in December 2016 directly from Faith in exchange for an honest review in time for the books publication date. It's taken me five months, but I finally feel able to put my thoughts down about this book. Faith has been lovely and understanding about my reasons for this delay, so please read on so I can explain. 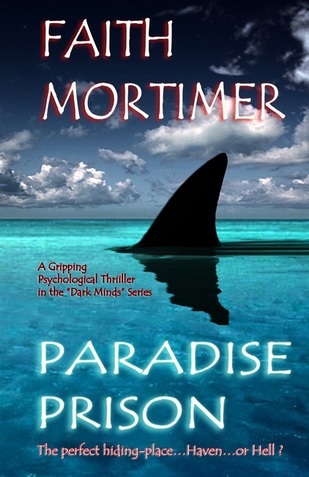 Paradise Prison is the fourth book in the Dark Minds series by Faith Mortimer, which is a collection of stand alone novels. I hadn't read any of her other books but this sounded really interesting and I jumped at the chance to read and review it. The story kicks off immediately and I was sucked into what was happening and I really felt for Gillian, what she was having to deal with was horrendous and she ended up in a situation that wasn't her fault but she had to face the consequences. Gillian goes through both the fight and flight instinct in her situation. but ends up sticking with the flight option to deal with the aftermath. She escapes her life but ends up in a situation far worse than she would have done had she remained to face the music. Though I felt for Gillian, I don't think she is a particularly likeable character, but I'm not sure that she's supposed to be. Harry is also an unlikable character and he becomes worse and worse as the story goes on as you can imagine. Even though they were unlikable it didn't affect my reading enjoyment and I still wanted to know what happened. When we get to the island the story does become a bit repetitive, but this is important to the story and it helps build the monotony of life there and the feeling of isolation that Gillian feels. I also got a weird feeling of both freedom and claustrophobia which grew the longer Gillian is there. The story is really well written and it was something different than anything I have ever read in a thriller. Now this is the bit that's difficult to write for me, there's some things that happen later in the book (which I won't spoil obviously) that triggered an anxiety episode and I had to keep reading, but not in an enjoyable way, in a panicked way to find out what happened. I have never had this happen before while reading a book and I didn't know myself that this would happen to me. This isn't the fault of the author as giving any information about this bit of the book would be a spoiler and would ruin some of the suspense and tension. With this happening I didn't feel I could give an honest review as my irrational brain was just saying give it one star. This would not have been representative of how good the book actually is and would have just been a knee jerk response due to my own personal feelings. So I put three stars down as a compromise. I have tried to write this review countless times since, but have not managed until today. Now that I have been able to distance myself from my response and thought about the book and the story I have decided that a true rating is four stars and I will be amending Goodreads to reflect this. So yes I would recommend this book, I'm just sorry it's taken so long for me to be able to share my review with everyone. 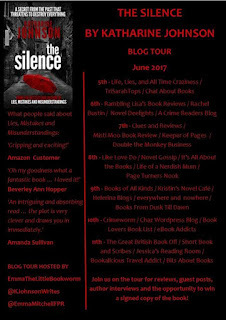 Today I am so pleased to be a part of the blog tour for The Silence by Katharine Johnson and I will be sharing my review and a special guest post from the author. Doctor Abby Fenton has a rewarding career, a loving family, an enviable lifestyle - and a secret that could destroy everything. The Silence is absolutely full of twists and turns and kept me reading to see what happened next, meaning that I read this in one sitting. The story takes place in England and Tuscany and the description of Tuscany is amazing, I really felt I was there and the sun was warming my skin as I was reading. The story is told both in current time and with flash backs to 1992, the flashbacks were done really well and it really added to the story instead of taking you out of what was happening. It was also interesting finding out things as Abby found them out herself. I knew pretty much nothing about the story before I read it and I'm really glad about that as I feel that is definitely the best plan for reading The Silence. Abby was certainly an interesting character and very well developed, but she was not a likeable character to me, some of her decisions and things that she did were not the best. I think she's supposed to be unlikeable though and it certainly took absolutely nothing away from the story, I just wanted to know everything! 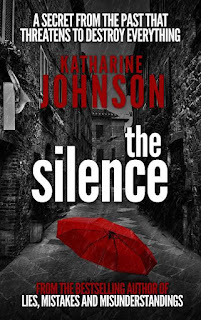 I'd definitely recommend this and I will be keeping my eye out for more from Katharine Johnson in the future. 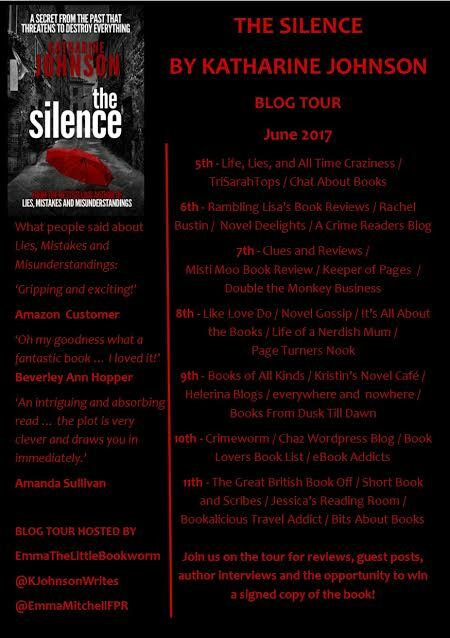 I gave The Silence 5 stars. I’m a mum, magazine journalist, writer, reader, dreamer and procrastinator. I live in Berkshire with my husband Mike, our three children and our spaniel Monty. I love The Apprentice – largely because I wouldn’t last five minutes on it! I’ve lost count of how many times I’ve watched The Talented Mr Ripley – to me it’s a perfect film. 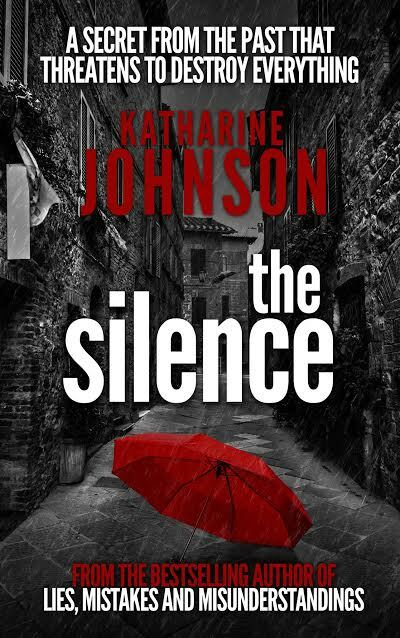 Katharine Johnson grew up in Bristol and now divides her time between Berkshire and Lucca, Italy. 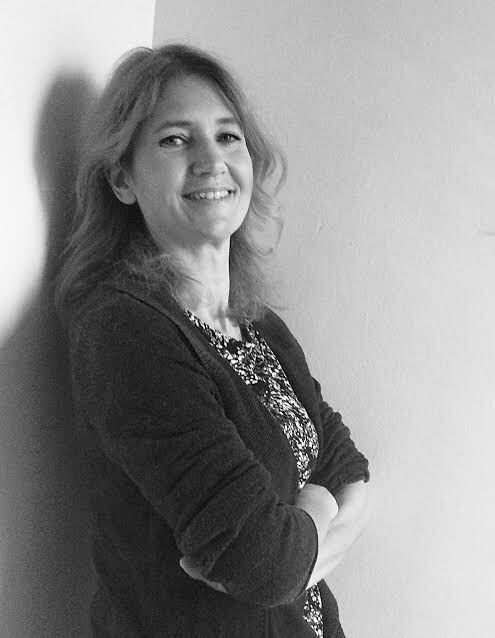 After doing a History degree she trained to be a journalist and has worked for a variety of magazines, writing about everything including the kitchen sink. She's loved writing since childhood and wrote her first book aged nine. When not writing she can usually be found walking her spaniel, doing the school run, playing netball or playing house in a stately home where she is a room guide. Katharine loves to hear from readers so if you fancy a chat do get in touch.